This entry was posted on Tuesday, November 2nd, 2010 at 4:00 am	and is filed under Comfort Food, Pumpkins and Squash, Vegetables. You can follow any responses to this entry through the RSS 2.0 feed. You can leave a response, or trackback from your own site. I love that category: Comfort Foods, Vegetable!!! 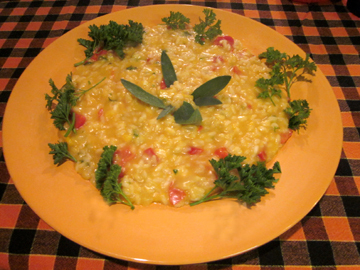 Malcolm is chief risotto maker in our house, so I will have to tell him about this recipe! Tinky, I simply have to catch up with your posts. One of these days I’ll get internet at the house so I can keep up with the blogs I follow. Too much work, or time spent out of the office, and I’m out of the loop. 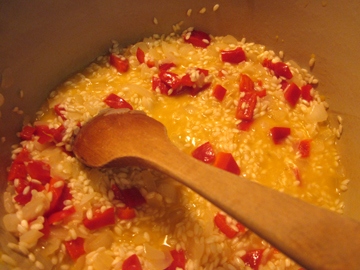 It just so happens that I have Arborio rice, butternut squach and chicken broth on hand and I think it will make a wonderful meal tonight, especially since we’re finally getting some autumn weather. wOw! That looks delicious! 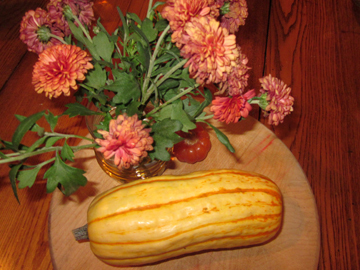 I love squash (and risotto) and this screams to be tried with my current favorite, kabocha pumpkin.